Make a great and lasting first impression. 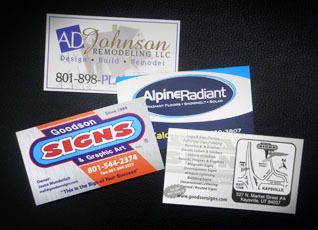 Business cards are a quick and effective way to expand the presence of your company. When your clients have your information at their finger tips in a professional, attractive format, they will feel confident in contacting you for the services they need. Our premium business cards are laminated with a special laminate on both sides that gives them a silky smooth feel and unique satin finish. These cards are also tear and water resistant. Cards are generally produced in quantities of 500 or 1,000. Contact us for pricing. You can submit your own design or take advantage of our design services and have us put together a professional card layout. Simply provide us with any imagery and information you would like included. Our business cards include a full color CMYK process front and a blank or gray scale back. Upgrades include, but are not limited to: full color printed back, rounded corners, die cuts, embossing and special sizes. Use our professional design services to arrange your card layout or if you're a do-it-your-selfer use our online services and design templates to design or upload your own layout.